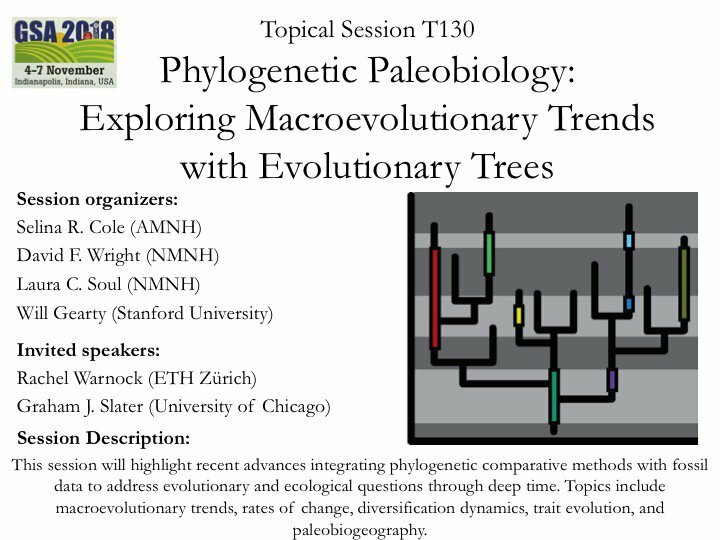 My co-chairs and I invite you to submit an abstract to our topical session entitled “Phylogenetic Paleobiology: Exploring Macroevolutionary Trends with Evolutionary Trees (T130)” to be held at the 2018 Annual Geological Society of America conference in Indianapolis, IN (Nov. 4-7). This session will highlight recent advances integrating phylogenetic comparative methods with fossil data to address evolutionary and ecological questions through deep time. Topics include macroevolutionary trends, rates of change, diversification dynamics, trait evolution, and paleobiogeography. Keynote presentations will be given by Rachel Warnock (ETH Zürich) and Graham J. Slater (University of Chicago). Feel free to contact us with any questions and to forward this announcement to others who may be interested.